I got this image from http://www.cafitusa.com/9-11-well-never-forget/, I was searching on google for pictures of 9/11 incident. The Image depicts one of the most important tragic events in history. On September 11th four men hijacked four planes that were heading to Los Angeles and San Francisco. Two of the four planes crashed into the World Trade Center, one hit the side of the Pentagon which was just out of Washington D.C. The last one didn’t make it to its location because the people stood up and fought back, making the plane crash in Pennsylvania. September 11th was a tragic event, many lives were lost. Over 3,000 people were killed in this horrific incident. It was not just the people in the World Trade Center that were killed, but also those that were there to save lives such as, paramedics, EMTs, firemen, and police officers. This image is not pixelated it is clear and distinguishable and you can tell someone digitally enhanced and combined different images together. The image is a JPG and the file size of it is 2048 by 1365. The author of this image is coach. 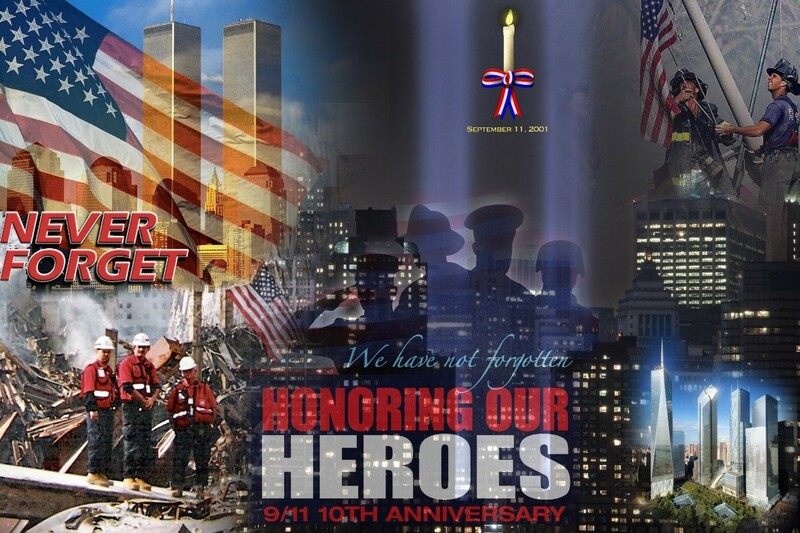 The intent of this image was to represent the heroes from 9/11, but to also show the world the lives lost. This image was created to demonstrate that regardless of such tragedy people were there to help one another in this time of need. It also represents homage to the families that lost loved ones. The author made this photo to place it on the internet. This image was created in 2014 and released in 2014. This image was created after the incident occurred. I chose this image, because it is an important event in history that changed the way many people viewed the world. We should never forget what happened, and to those that lost their lives trying to prevent further tragedy. Such as, those selfless firefighters and paramedics that put their lives on the line to save those from the collapsing buildings. This is what I consider to be a hero and why I wanted to post this picture because those heroic citizens saved lives and lost their own lives for someone else’s. I put this flyer up on the bulletin board in my dorm. 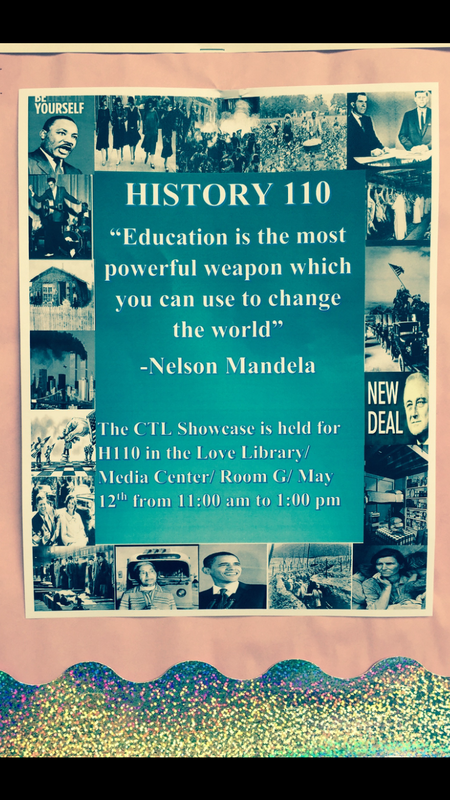 I chose a quote by Nelson Mandela because history is part of our education which has changed our world. Around the border I put pictures from every year of the Hist book to show how history has evolved over time. Today Putman mentioned the My Lai Massacre in class today that took place in March 1968. US soldiers brutally murdered women, children and the elderly. There were about 500 innocent people from South Vietnamese that were killed. The people did not provoke retaliation yet, when the soldiers arrived and the US military fired at them. This was a real wakeup call for the soldiers, they did not even know why they were still fighting. Their target was to kill Viet Cong people, but none of them were found in the village. Most of the soldiers that killed the innocent people it was due to frustration. They were tired of being at war and wanted to go home. 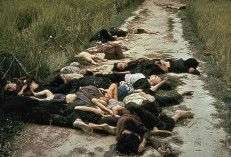 Below is a picture of the My Lai Massacre, people were chased into the road and shot. President John F. Kennedy was assassinated in Dallas, Texas on November 22, 1963. Oswald was killed before confessing he had killed President Kennedy. As of today his assassination is still considered a mystery. 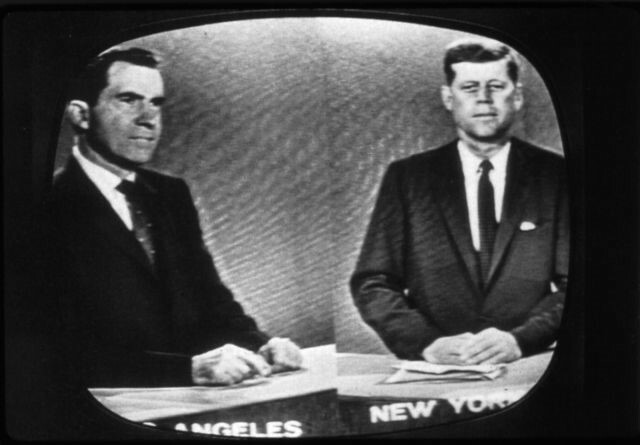 Kennedy was wounded in the back, throat and fatally shot in the head. Kennedy was rushed to the hospital but there was nothing the doctors could do and was pronounced dead. On Sunday morning as Oswald was being transferred to the county jail, Kennedy’s casket was moved from the white house to the capital. Many people in the United States mourned the death of Kennedy. Many people liked Kennedy and felt their lives were similar to his. 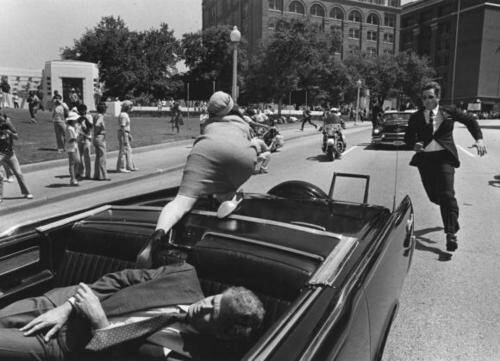 Below is a picture of when the assassination occurred. 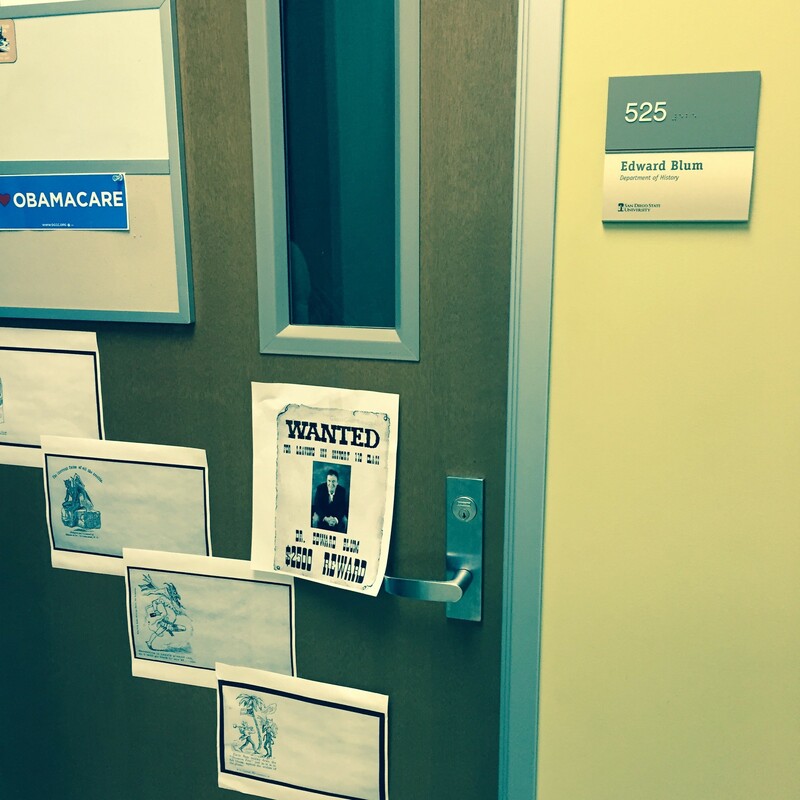 Blum has left many disappointed kids, without even an explanation for his departure. Everyone is still in shock how a teacher could just leave without an explanation or even a goodbye. Even though he was seen running at Lake Murray and is perfectly healthy. I think he should have at least said he was leaving. I do not think it was fair leaving his students behind, his Ta’s and grad students and those that he was supposed to give a recommendation letters to without a word. History 110 is not the same in lecture, I wish Blum would come back or let Linnea teach the course so it could go back to how it was before. In class this week we talked about the Cold War, I found the atomic bomb of Hiroshima to be interesting. Hiroshima was launched in Japan on August 6, 1945, which was the first atomic bomb to be used. The atomic bomb that Truman used carried 20,000 tons of TNT. The Hiroshima bomb killed 80,000 thousand people immediately and later more were killed due to radiation. Japan thought America was bluffing and would not use this bomb against them. But little did Japan know America was serious and an unexpected surprise happened to Japan on August 6. Many say that the war ended earlier because Japan surrender to America. If this atomic bomb was not used, WWII may have gone a couple of years longer and more lives would have been lost. 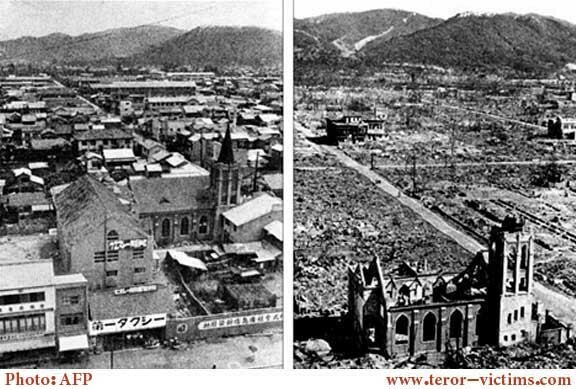 Underneath is a picture of Hiroshima before and after the atomic bomb. During section 1 on Wednesday talking about our primary sources how the 1920’s was a big change for women. Women started changing the way they looked, by cutting their hair, dressing less conservative, and most of all they were allowed to go to bars with guys. Women back then did not always want to stay home and take care of the kids, they wanted more. Who would want a life getting told what to do and not living the life you want. It was interesting to know that women could not go to a salon to get their hair cut, they had to go to a barber. Now actresses in our era have even shorter hair than the 1920’s. History from the 1920’s still has an impact on how people do their hair today. During the reading in Hist racial segregation there was a big problem with African Americans they were not allowed in the same schools as white people, they could not vote or even sit in the front of the bus with the white people. 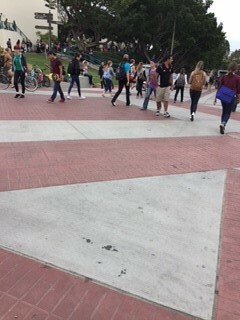 Considering how people were segregated we have come a long way today there is so much diversity at San Diego State University, people do not have a problem hanging out with people of different races. Today everyone is considered an equal in getting the education that everyone is entitled to, difference is a thing of the past. Social change has been slow, but the persistence of fighting for what is right and deserved of all we have become a society of greatness.